The Jasper area is as naturally beautiful as any in North America. Everywhere you look there is something for the nature enthusiast to love, from the gargantuan surrounding snowy mountains to the sparkling lakes and rivers. A family vacation to Jasper, in addition to the obvious surrounding splendor, comes with a cornucopia of activities and attractions unique to the area. Skiing and snowmobiling in the winter, swimming, hiking and biking in the summer... These five resorts offer all that, in addition to cozy accommodations and unbelievable hospitality. Few places combine a spectacular environment with astounding luxury as well as the Mount Robson Inn. The surrounding mountain ranges and the charming town of Jasper make for a perfect vacation destination for romance, friends, and family especially. A scant five blocks from downtown, fun and activity are never far away at Mount Robson. Its 80 rooms are as opulent as they are diverse, with accommodations ranging from Euro-style studio rooms to king suites with couples Jacuzzis to spacious suites for family vacations. However, each and every room comes complete with pillow top mattresses, fridges, microwaves and high speed Internet. Continental breakfast comes with the territory, of course, so make sure you get up (relatively) early to start your day off right. Then head into town and discover all that Jasper has to offer your family! Other amenities include two hot tubs, free parking, ski storage, and guest laundry facilities. Serenely nestled at the end of Jasper’s main street where the Rocky Mountains meet the town site, Maligne Lodge is a relaxing haven that also contains oodles of family fun. Maligne Lodge manages to strike the perfect balance between relaxation (for adults) and activity (for kids). Parents can take a deep breath of refreshingly crisp Rocky Mountain air in the morning, then kick back and take it easy. Children, meanwhile, can fill their days whatever their hearts’ desire, be it skiing, hiking, biking, or swimming. Regardless of what you all choose to do, you can certainly appreciate the cozy lodgings and the resplendent Rocky Mountain backdrop. 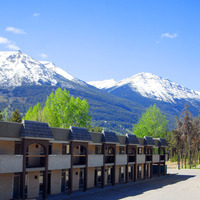 The hotel is just 1.1 kilometers from the Jasper train station. Amenities include an indoor pool, an outdoor hot tub, an exercise room and a sauna. Jasper National Park is a UNESCO World Heritage Site, and the iconic Fairmont Jasper Park Lodge resort invites you and your family to experience the nature and abundant wildlife while staying in pure luxury..
700 acres of pure forest mountain majesty surround this year-round luxury mountain resort. From the shores of pristine Lac Beauvert you and your family will sink into a lovely cedar chalet or signature cabins, all connected by picturesque paths. When you aren't relaxing inside their rustic interiors, you'll be golfing, hiking, canoeing, kayaking, horseback riding, and mountain biking in the summer and ice skating, snowshoeing and skiing in the winter. If that list of activities doesn't get your family excited, nothing will! You can also view the are from high up in the air on a helicopter tour! After an active day outdoors, rejuvenate with a signature treatment at the luxurious Fairmont Spa, inspired by the energy and beauty of Jasper National Park. With a backdrop as impressive as the Rockies, the Astoria Hotel has a lot to live up to. Not only does it match those lofty expectations; it exceeds them. Families from all over the world flock to the Jasper area for its wealth of activities and its beautiful resorts. Astoria has (is) both. Lodging is busting with character and charm, and can be found in the center of the village of Jasper, Alberta. If your family can't agree on something to do, don't worry- there's something for everyone. In winter, skiing, snowboarding, and ice climbing are all popular activities, while the summer provides excellent opportunities for hiking, mountain biking, and much more. If you take just one thing away from this list, take this: no matter what time of year you choose to stay at thet Astoria Hotel, you'll leave truly appreciating everything the Canadian Rockies has to offer. The main floor of Astoria Hotel is occupied by Papa George's Restaurant and the De'd Dog Bar & Grill. The Overlander Mountain Lodge specializes in hosting large families and groups, something that’s immediately evident upon arrival. There are a total of six unique chalets at the resort, all optimally upholstered and furnished. Each boasts open living spaces, cozy guest rooms, gas fireplaces, furnished patios, and gas BBQ’s so your family can truly enjoy that glorious Jasper weather. Chalets are close enough to the city for easy access, yet far enough away that you can feel truly serene. If you don’t need that much space, settle into one of the Overlander’s fantastic rooms, all offering dazzling views of the Rockies. The lodge is a 9-minute walk from the entrance to Jasper National Park and 23 kilometers from Hinton. Amenities include a restaurant, a lounge with a fireplace and a patio with mountain views.